Brookings, S.D. – It’s been a good year for winter wheat in South Dakota. In eastern and central South Dakota, SDSU varieties and experimental lines were among the top entries in the trials, while in western South Dakota, both private industry and SDSU material did well. “Producers should look at multiple years of data from sites closer to their location when selecting the variety,” said Sehgal, who is an assistant professor in the Department of Agronomy, Horticulture and Plant Science. He says the winter wheat varieties developed by SDSU named Ideal, Oahe, Thompson and Redfield, which have already been released, did very well. “The winter wheat crop, in general, looked good in terms of test weight and protein and the market is far better than last two years,” Sehgal said. In 2017, only 50 percent of South Dakota winter wheat acres were harvested because of the severe drought. He expects the winter wheat harvest this year will increase by 80 percent over last year. During the last four years, Sehgal has increased the number of lines being tested by nearly 50 percent. He has expanded the test plot locations from five to seven last year. 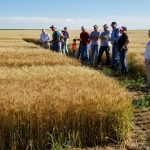 “We initiated early yield trials of 1,000 new genotypes at the Dakota Lakes Research Farm east of Pierre,” he said. The two new locations are near Hayes, which is about 40 miles west of Pierre, and near Wall in western South Dakota. This fall he plans to add a site near Mount Vernon, just west of Mitchell, as another test location. “We have expanded the program considerably,” Sehgal said. He emphasized the importance of early generation testing in central and western South Dakota where most of the winter wheat is grown. These areas tend to experience drier growing conditions than eastern South Dakota. “Breeding is a long-term process,” he said, noting that it takes nearly 12 years from when the cross is made to the release of a new variety. Therefore, Sehgal emphasized the need to anticipate potential challenges years ahead and develop germplasm in that direction. “We need to keep investing in breeding for the long-term good of the program,” he said. The SDSU winter wheat program is supported by growers through wheat checkoff funding administered by the South Dakota Wheat Commission. “This is the backbone for all important research, along with federal USDA- National Institute of Food and Agriculture (NIFA) support,” Sehgal said. In addition, the South Dakota Crop Improvement Association and South Dakota Foundation Seed Stock helped make the breeding program more efficient by supporting the purchase of a new combine and tractor as well as repairs for other equipment. Increasing wheat yield is a major objective of the U.S. Department of Agriculture Wheat Coordinated Agricultural Products Grant. South Dakota State is one of 15 breeding programs participating in the $9 million program, which is led by University of California-Davis. Sehgal and his team will receive $432,000 during a five-year period to work on cloning yield-related genes. One doctoral student is working on this project. In addition, Sehgal led the physical mapping of four wheat chromosomes as part of the International Wheat Genome Sequencing Consortium, which recently published a fully annotated reference wheat genome in the August issue of Science magazine. The wheat genome is more than five times the size of the human genome. “The challenge is to enhance yield while maintaining good quality and disease resistance,” Sehgal said. Using genome-wide association and the new wheat genome sequence, he and his team identified six genomic regions highly associated with resistance to spot blotch, a fungal disease that affects the leaves and typically leads to yield losses around 20 percent. Three of these genomic regions are new, he said. In addition, the researchers developed some molecular markers, which can be used to monitor the movement of these genes. Their results were published in Frontiers in Plant Science. Winter wheat breeder Sunish Sehgal, third from left, talks to producers in Selby, South Dakota.